The following is a brief biography. A more detailed vitae can be found here. Chris Tong was an altar boy in the Catholic Church when he was in elementary school, in the hope that, by this means, he might have direct experience of God. In 1973, as a junior in high school, he received a grant from the state of New Jersey for new research into the origins of life. In sixth grade, Chris won third place in New England, in the "Youth Speaks" public speaking competition. The two avenues of investigation — the spiritual and the scientific — would remain key facets of his lifelong interest in exploring "the bigger picture". And his early-demonstrated need to communicate to the world personal discoveries of great value would greatly shape his later life. From 1984 through 1994, he was a computer science professor at Rutgers University. During this period, he was an award-winning teacher, and a world-renowned leader in the area of Artificial Intelligence and Design. His technical publications include the state-of-the-art "Artificial Intelligence and Engineering Design" series (1992, Academic Press, volumes I, II, and III), and numerous papers in the leading AI journals and conference proceedings. He chaired numerous, international AI workshops, co-managed several multi-million dollar grants from DARPA (the Defense Advanced Research Projects Agency that created the original Internet), and was also an invited visiting researcher at well-known institutions that included MIT, IBM Thomas J. Watson Research Center, Xerox Palo Alto Research Center, and Siemens Research. In 1994, Chris left academia to create Enchanted Websites (and its subsidiary web hosting service, Host Your Site and domain name registration service, Register Your Domain Name), whose success led to his inclusion in Who's Who in Executives and Professionals (1998-99), to his selection for the 2002 National Leadership Award by Congressman Tom Davis and the National Republican Congressional Committee (NRCC), and to the NRCC's selection of Chris as the Special Advisor to the Chairman on the NRCC's Business Advisory Council. As president of Enchanted Websites, Chris has led a small staff in designing, developing, and marketing close to one hundred commercial and non-profit websites, and hosting hundreds of domain names and websites. Clients have included: Color Me Beautiful, the internationally acclaimed cosmetic line and bestselling book that revolutionized the world of color cosmetics by introducing the concept of choosing color by season; Kaiser Permanente, the #1 non-profit HMO in the United States; and publicly traded Adrien Arpel, one of the most recognized and respected skin care lines in the world. Many of the sites designed by Enchanted Websites have won recognition for the quality of their design, including an excellent review from the #1 newstand web magazine, "The Web", a feature on MSNBC's nationally broadcast program, "The Site", Yahoo's "Pick of the Day", and sites featured in Entrepreneur Magazine, USA Today Magazine, and Entertainment Weekly. Many of the sites marketed by Enchanted Websites have had traffic to their site increased by more than tenfold through Enchanted Websites' state-of-the-art online marketing techniques. Apart from Enchanted Websites, Chris's current interests lie in applying both traditional mass-market publishing and the latest Web technology toward promoting "spirituality that works", his "second career" since 1990. Leading up to this, was a life of spiritual seeking that took a variety of active forms: psychotherapy (1978-80); encounter groups (1981-83); bioenergetic therapy with Leslie and Alexander Lowen (1984-86); and an extensive study of Eastern traditions (1982-88). In 1989, Chris became a devotee of the Spiritual Master, Adi Da Samraj, and began practicing the spiritual way of Adidam. From 1990-1994, he presented numerous full-day workshops in Boston and New York City on spirituality-related topics. 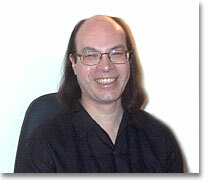 In 1994, at the very outset of the Web, Chris launched Adidam's first website, winning awards from Magellan and from Lycos for the site's "comprehensive presentation". He was the head of Adidam's Education Department from 1994-95. In 1995, he became the production manager of Adidam's Dawn Horse Press, where he produced the first mass-market editions of two books, The Knee Of Listening and The Method Of The Siddhas. In 1997, he was the head of Adidam's Lay Renunciate Order and co-chairman of the Adidam Samrajya. More recently, Chris has focused his efforts on creating multimedia materials that make genuine spirituality and spiritual practice very accessible to the general public by founding The Practical Spirituality Press. The Press's Practical Spirituality Series is being released in 25 e-books, and covers such key topics as: Why do we suffer? Does God exist? The nature of death and after-death; the secrets of human transformation; belief in God vs. experience of God; and the happiness of genuine Spiritual Awakening in God.